The foliage on the windward side of the plant is brown, with the margins of each leaf being more browned than the centres. Trees and taller shrubs appear to be permanently leaning over. Fruit (particularly apples) can become russetted. The drying effect of the wind causes the browning of leaves, which can be exacerbated by sea salt in coastal locations. Where plants are leaning this is due to the buds being killed on the windward side by the drying effect of the wind causing drought-like conditions. 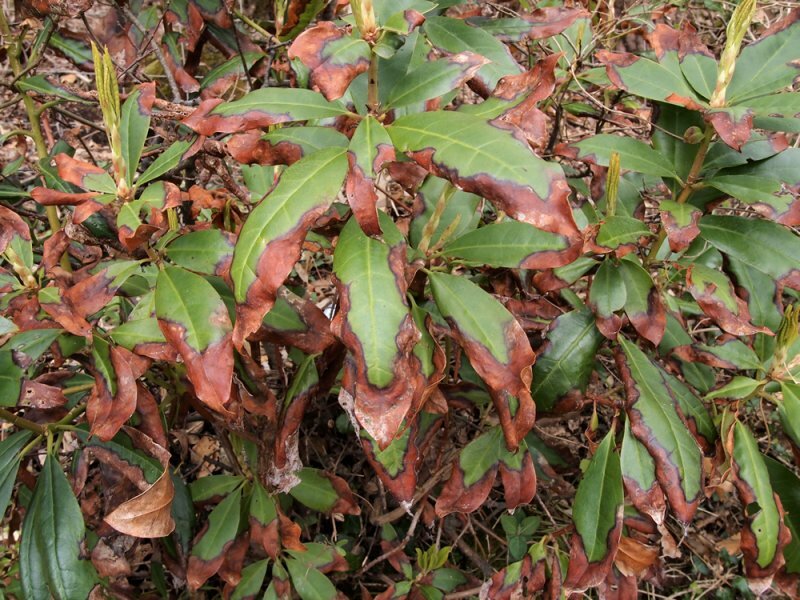 The effects of the wind scorch will generally not kill the plant but they can cause cosmetic damage (browning of foliage and leaning of the entire plant) and severely weaken the plant overall. Affects trees and large shrubs in exposed areas, particularly at high altitudes and coastal locations. 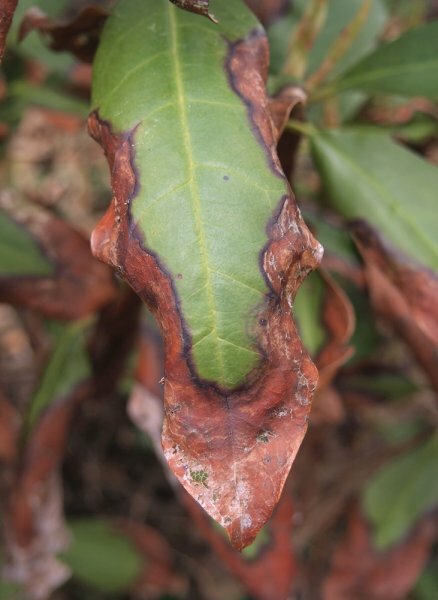 Large leaved evergreen plants are particularly susceptible. The problem is usually greater in the winter when frozen soil reduces the water available to the plant to replenish that lost from the leaves. Plants in containers can also be severely effected when they have a lack of water available due to freezing or poor watering. Creating a shelter belt of resistant species (eg beeches, Monterey cypresses, Austrian pines or sycamores) can protect more sensitive plants. Where fruit is affected by russetting it is rarely worth taking action to prevent it, since this can happen even in relatively sheltered gardens and doesn’t affect the taste of the fruit. In a garden you can create a windbreak using willow hurdles or a deciduous hedge – you should aim to filter the wind by about 50% rather than blocking it altogether (using a wall or evergreen hedge) which can cause turbulence. Sensitive, woodland species, such as Acer palmatum or camellias can be planted under taller trees, providing them with a more natural and protective environment. Move container grown plants into a sheltered location in the winter or use winter protection such as horticultural fleece around the plant and bubble wrap the container to retain water and reduce the risk of the compost freezing. In the summer ensure that they are regularly watered. Prune out the damaged growth in the spring (except for conifers which don’t respond to hard pruning, in these cases the damage may be permanent) and feed the plant regularly throughout the spring and summer to encourage fresh growth. Leaf scorch is a common disorder which can be caused by a wide range of problems, in addition to wind. Possible other causes include nutrient deficiencies, drought, low temperatures, soil compaction, weedkillers, transplant shock and over-fertilising.